I'm saying goodbye to '25' soon. Early this year, I made various promises to myself and luckily a lot of them are fulfilled by now. My loooonggggg time dream of visiting Korea also came true last July, which definitely tops all the year highlights!! I still can't believe that it actually turned into a reality. It's one of the best things that ever happened to me, and it made me realised that 'good things does come to those who wait'. I want to write about my experience there but I haven't really got the time to start on that. Let's hope I will be inspired to write up on it soon. LOL! Now, it's time to write down a new resolution for 2017 and start hoping that next year would be better! Two years ago, I would never expect myself to be working in such different sector. Thankfully, I made the right decision when I decided to pursue my career this way. Although I miss doing programming sometimes, working in Social Media taught me a lot of things too! I definitely have to credit my mentor/butterfly mamasan/head of department Tammy for guiding me from the start. Also my awesome colleagues in Creative Communications department who are just amazing and magical; Mira, Sydney, Bo and our ducklings (interns) Venice & Bo. They made my office life so much easier with their everyday antics and laughter. Never a dull moment in our team! I hope this great vibes will continue and spread everywhere in 2017. Wishing that our second year in Althea would be much more wonderful than it is now!! My blogging activities slowed down a bit this year as I decided to focus more on my career. It doesn't mean that I'm giving up on it though. Writing is still one of the things that I enjoy doing and I plan to continue it, even if I have to do it in my own pace. 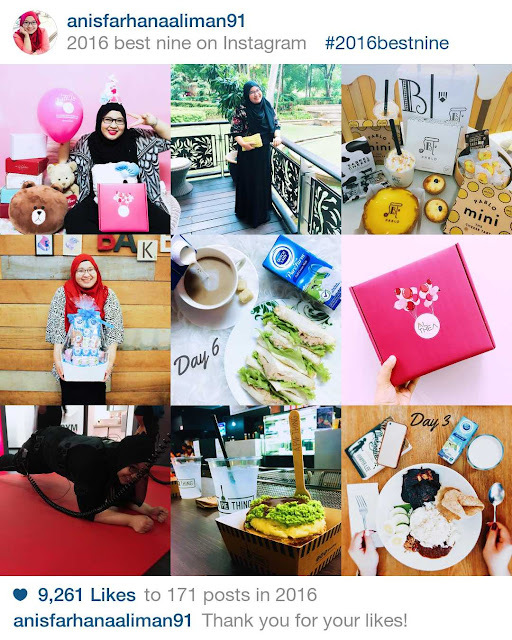 Despite all that, I still got a lot of amazing collaborations thanks to my blogging community Butterfly Malaysia! Some of my favourite review experiences in 2016 will be the Impulse training experience which requires me to attend a 10 sessions workout class and my collaboration with Malaya Optical in personalising my glasses style. I (kinda) made my own Youtube channel too and posted some videos on it! It's just a 'for fun' decision at the moment as I still find myself awkward in front of camera. I haven't been uploading any video either for these past few months but I hope next year will be better! As for the most surprising news in 2016, is that I managed to win the Grand Prize for the Dutch Lady blogging contest not long ago. Was not expecting that at all! All these are such a blessing for me and I am really thankful for it. I am so happy about a lot of things this year! My bucket list of watching Kyuhyun musical came true this year as I got to watch his Mozart performance in Seoul. It was like a dream!! After all these years of watching rehearsals video and fancams, I feel like I have levelled up in my fangirling game! Not just that, the remake of my favourite anime Sailormoon was released this year too!! While my Potterhead side got new treats with the Cursed Child and Fantastic Beast release. What an awesome year to be a fangirl. I am so looking forward to 2017! Hope I can grow much more in the new year personally and career wise. I wish everyone a Happy New Year and let's pray that we will be a much better person than we are today as we grow one year older!